To view images — click on left navigation column. Brief introductory comments follow. 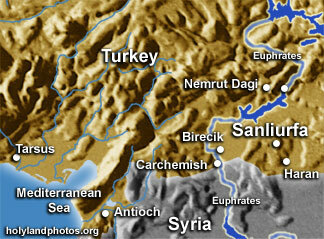 Sanliurfa is a city of about 300,000 located in eastern Turkey — 34 mi. [54 km.] north of the Syrian border. The name means "Glorious Urfa." Although there are some traditions that Abraham was born and raised here, it is more probable that he originated from the "Ur" located in southern Mesopotamia — south of Baghdad in modern Iraq. From the fourth century B.C. until A.D. 1637 the city was known as Edessa. It was famous as a Roman city, as a center of Christianity (Nestorian), a Moslem center, and briefly, a Crusader County. Today it is a center of pilgrimage for Moslems who come especially to worship at the purported birthplace of Abraham.